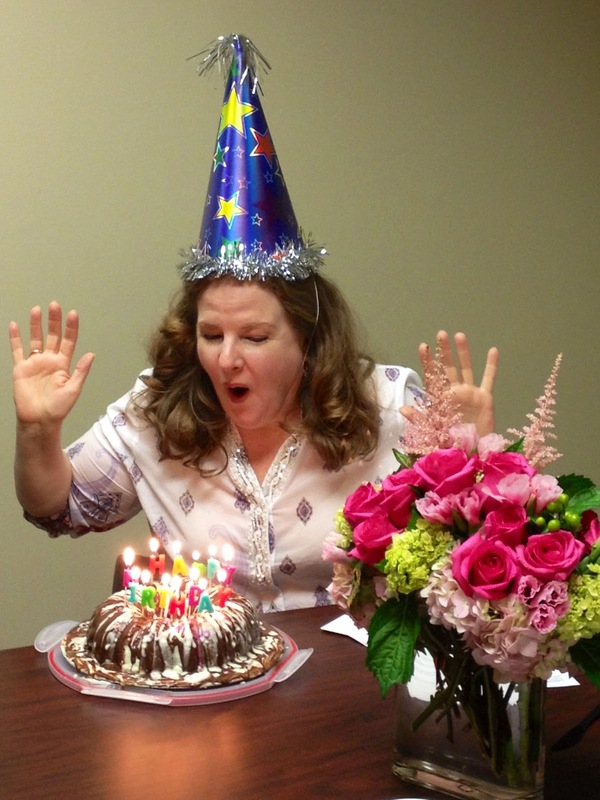 Paige McDaniel's Blog: I hate birthdays. Mine was yesterday -- 52 years young. NOTE: Just writing that makes me want to vomit -- the young part, not the age part. I come from a long line of women who tell their age. I have always been proud of my mom (and my grandmother before her) for that. Why do we want to get older? It just means more wrinkles and more body break-down. NOTE: My left knee was so sore yesterday that I had to pull out the Voltaren Gel last night and rub it on. My left wrist is hurting today. And I have something in my right eye. Life is hell. The other thing about celebrating birthdays is you end up with sweet wonderful friends and family who bring cakes, cupcakes, flowers, and more and they make you wear a hat and take your picture. A birthday is just another day for me. Just another Tuesday in August. Hot as hell. The circus is in town. I know this because the circus is always in Dallas on my birthday. I had lots of birthday parties at the circus. I also had swimming pool parties, costume parties, slumber parties, and more. NOTE: I even had a toga slumber party in 6th grade -- all the girls came as goddesses. This was long before Animal House made toga parties de rigueur. True! Ask Susan Cleaver Hardaway about it! Kids do need parties and need to celebrate. I was lucky enough to have a great mom who made sure that my childhood birthdays were fabulous. I also know that there are kids in Dallas who have never had a birthday party. Never had a cake or a hat. Never had a celebration. That's why Community Partners of Dallas provides gift cards to CPS caseworkers to take kids out to McDonald's or Dave & Busters or the Dallas Zoo or just to Sally Beauty Supply. To celebrate a little. Maybe it's because I've had so many wonderful birthdays that I don't care about them anymore. But I certainly care whether a kid gets one. I bet you do too. Please visit www.CommunityPartnersDallas.org to celebrate.